In 1997, Korean poet Ko Un and a few companions spent forty days of rough traveling through Tibet, despite the fact that years before the poet had learned that an undiagnosed attack of tuberculosis in his youth had seriously damaged his lungs. Enduring terrible pain and near death, the poet survived to write, three years later, the powerful poems of this volume, which both describe and evaluate his journey. As Ko Un writes in his Preface to Himalaya Poems, "Narrowly avoiding falls, I scrambled up and down precipices, crossed plains, on the way to the last place we could go. Now there seemed to be nowhere left for us to go, and nowhere for us to go back to." For the poet it was not "truths" he discovered in the poor and yet magical Himalayan mountains—after all, the poet queries, "Who speaks truth? "—but "what has raised me is... the road," the journey itself, where, as he describes it, he hoped to encounter "the hinterlands of history." Ko's marvelously direct and moving poems continue to reveal just how majestic and intelligent his work is. 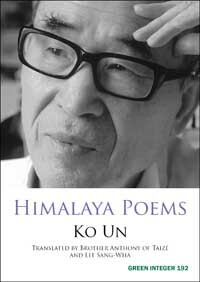 Beautifully translated by Brother Anthony and Ko Un's wife Lee Sang-Wha, Himalaya Poems is a stunning testament to endurance and the energy of life.